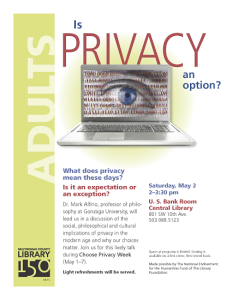 In 201 5, The Multnomah Public Library observed Choose Privacy Week by hosting “Is Privacy an Option?” a talk given by Mark Alfino, a professor of philosophy at Gonzaga University. Alfino discussed issues around privacy, transparency and why individual privacy choices matter. Multnomah also offered patrons an opportunity to attend classes to learn about privacy and safety online. The University of Wisconsin at Milwaukee’s Center for Information Policy Research hosted Washington University law school Professor Neil Richards who discussed his book, Intellectual Privacy: Rethinking Civil Liberties in a Digital Age . The Greene County Branch of the Jefferson-Madison Public Library published an article in their local paper promoting Choose Privacy Week that included a bibliography of several books about privacy and government surveillance. The University of Tennessee at Knoxville library marked Choose Privacy Week with a blog post while the Jefferson College library created a Choose Privacy Week libguide. Portland Community College also created an online resource for Choose Privacy Week for their users. We know that libraries across the country are hosting fantastic programs on privacy. Please share your ideas, experiences, and resources. Send us photos, flyers, and press coverage of your event so that we can include it here.